For my latest Ask Dr. Geier column, I answer the question of the reader in Michigan who wants advice for her teenage daughter. 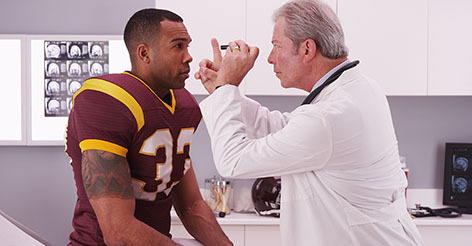 She asks one of the most common questions I receive about sports medicine careers – namely how you can one day become the team doctor for a professional sports team. My daughter Cyndi is 17, and she is part of a gymnastics Jr. Olympic team. She knows a lot about injuries personally and a lot of the ups and downs of it. She wants to be sport medicine doctor and wants to travel with a team. She says she doesn’t want be stuck in office. What do you think is a good school to go to, and how do you get with a team as its doctor? Betty, that is a great question! I’ll start by saying that there is not one correct path. There are many paths that can ultimately lead her or anyone who wants to work with a sports team to that goal. To be fair, athletic trainers and physical therapists often work with sports teams, so that can be another terrific career option. For purposes of this post, though, I’ll discuss the journey specifically toward being a team physician. Once in medical school, you have to get good grades and good scores on the USMLE boards. Most head team physicians are orthopaedic surgeons. Orthopaedic surgery is a very competitive specialty. Most orthopaedic surgery residency programs only take medical students in the top 10% of their medical school classes. Those classes like biochemistry and histology that don’t seem to matter actually do. You probably can’t do much to get a residency spot in your first two years of medical school, but you can knock yourself out of contention by not getting good grades. Alternatively, you can choose a non-surgical medical specialty in which you later specialize in sports medicine. For example, you can do a residency in pediatrics, family medicine, emergency medicine or physical medicine and rehabilitation and then do a primary-care sports medicine fellowship. If you go into orthopaedic surgery, in the later years of your residency, you’ll have the option of performing extra training in a fellowship program. There are many subspecialties within orthopaedic surgery, including hand, pediatrics, trauma, oncology, foot and ankle, and spine, but most team physicians now are fellowship trained in orthopaedic sports medicine. This specialty is also competitive, as close to one in every three orthopaedic surgery residents now applies for a sports medicine fellowship. After fellowship, you get a job. You can practice as an orthopaedic surgeon specializing in sports medicine in an academic practice, a private practice group, or employed by a hospital system. Often primary-care sports medicine physicians work within an orthopaedic surgery group to see patients with musculoskeletal injuries along with the surgeons as well as helping to provide medical coverage for sporting events. Gaining the opportunity to serve as a team doctor is challenging as well. If there is a particular sport in which you have an interest, you can work with youth and recreational teams in that sport. You can give talks in your area to athletes in that sport to build name recognition in that community. You can work with your hospital to provide medical coverage for a pro team in concert with a marketing relationship between the team and the hospital. Such arrangements have been criticized in recent years, but most of these relationships have some sort of marketing agreement. As you can tell, the path toward a career as a team doctor is not easy. If it is a goal you are passionate about achieving, though, you will put in the work to get there. And for those who love it and do get there, it’s absolutely worth it! If you want to learn more about the educational process and tips to succeed, check out Work and Succeed in Sports Medicine!